No one can put wraps on their cars anymore. That trend is officially over now. Canadian dance music producer Deadmau5 just dropped the mic on car wrapping for good with his wonderful Ferrari 458 Italia Nyan Cat wrap. Nothing can top this supreme auto troll. 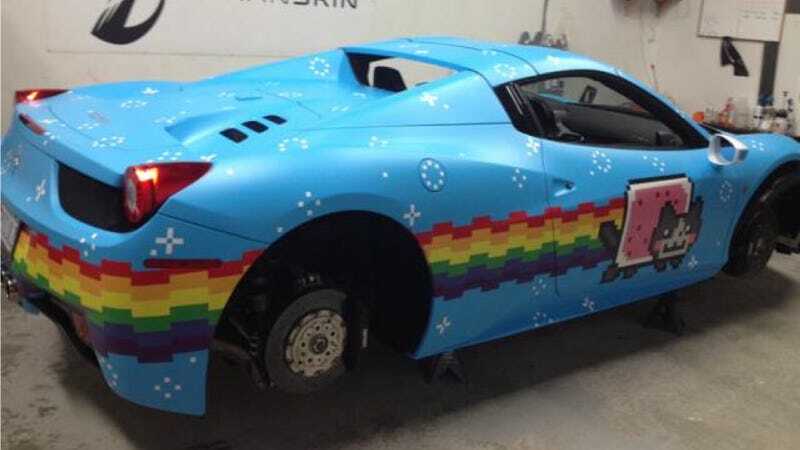 We first heard about Deadmau5's plans to wrap his Ferrari as a salute to the Nyan Cat meme back in October, but it looks like he's finally done it. A few pictures of the completed project popped up on his Facebook page yesterday. The license plate even says EPICLULZ! Win indeed. The Supercar Kids also confirmed Deadmau5 will be entering the Gumball 3000 rally this year, likely in a BAC Mono. I'm sure this would make a superb backup. Now if you'll excuse me, I have to go listen to the 100 hour version of Nyan Cat on repeat.